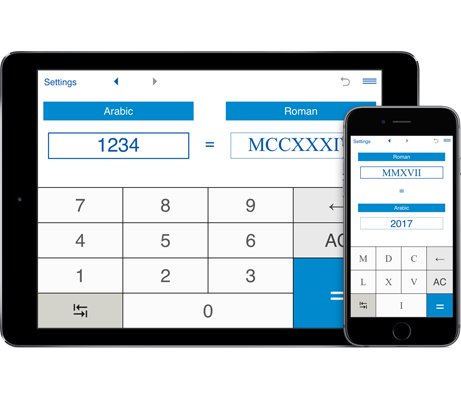 A handy and easy to use app lets you convert Roman numerals to Arabic numbers and vice versa. The Roman Numeral Converter lets you easily convert Roman numerals to Arabic (regular) numbers online. 1. Click the button with two arrows to select "roman numerals to numbers conversion". 2. Enter a Roman numeral that you wish to convert to the regular number and press "=". The Roman number you entered and its decimal number equivalent will be displayed. The Roman Numeral Converter validates the input of Roman numerals. Please enter Roman numerals using the letters I, V, X, L, C, D and M on the application's keyboard. You can enter Roman numerals between I and MMMCMXCIX. Roman numbers cannot be negative. There is no Roman numeral zero.